[German]Are you suddenly seeing a ‘Surface – HIDClass 4/26/2018 12:00:00 AM – 3.3.206.0’ driver update on your Windows machines? But you don’t have a Surface devices? Here are some details about that update. Currently strange things are happening on Windows systems again. Windows Update suddenly offers users a ‘Surface – HIDClass 4/26/2018 12:00:00 AM – 3.3.206.0’ driver update. Surface device owners will accepting this update. But owners of normal Windows desktop devices are amazed at least, because what is this driver update for? After I recognize this topic, I started an Internet search. The topic has been mentioned on dozens of websites. On reddit.com there is this thread, where the thread creator was offered the update under Windows 7 SP1. The user has posted the following screenshot of Windows Update. One of the newest Win (7 pro) “important updates” “Surface – HIDClass – 4/26/2018 12:00:00 AM-3.3.206.0” has started appearing on 2017-05-11. I usually check to know what I’m installing, but I couldn’t find info concerning this on the net, and neither do I recall this type of updates from earlier. Even the update becoming available after some 2 weeks from its release is making me wonder, to say the least. Clicking the “More Information” link redirects to a generic page, which means that no info/page is available at the provided link. P.s. : This appeared on a custom-made desktop, not in a way related to the Surface device. It’s a bit odd that a Surface driver is offered on a desktop system, and then under Windows 7. MVP colleague Robert Aldewinkle takes this up in this Microsoft Answers forum post. Is there such a thing for a Surface 2 Pro? My Screen cover is attached but because my tablet’s orientation is Portrait the Screen cover is disabled. My keyboard is normally a Wireless USB but recently I have been using Remote Desktop Connection. Searching the Microsoft Update Catalog reveals an update for Windows 7 SP1, Windows 8.1 and Windows 10 Fall Creators Update and later with a size about 400 KByte. 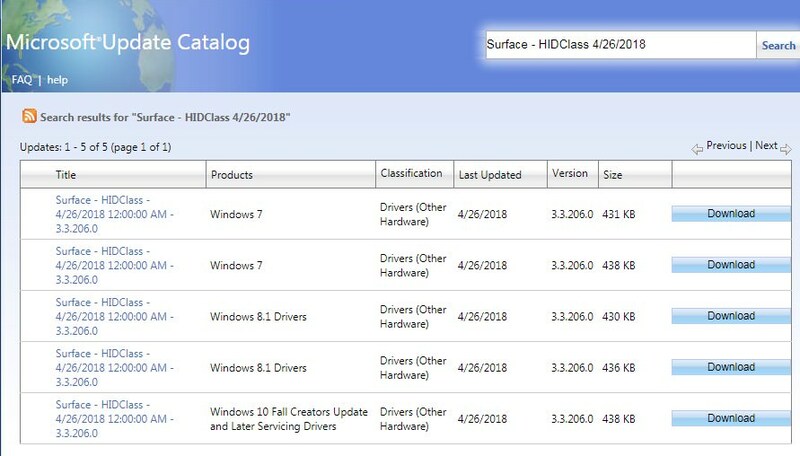 This is referred as a ‘Description: Surface HIDClass driver update released in April 2018’. The driver belong to the “Microsoft Hardware USB Keyboard” model and has the update date 04/26/2018 and supports the following hardware IDs. If you search the Internet for this device ID, you will find many websites that offer the driver for download. But that doesn’t get you anywhere. The best source is this GitHub address, which contains an extract from an .inf file. ; Copyright (c) Microsoft Corporation. All rights reserved. It is a driver for Plug&Play USB Input Devices, which comes from Microsoft. Surface – HIDClass is an update for Microsoft Hardware USB Keyboard. This is not specifically for Surface Tablets and Laptops. However, if you are having issues with this update, you can Hide it by downloading the troubleshooter in this link. If you have issues with this update, you should uninstall it and then block it. Under Windows 7/8.1 this can be done via the context menu in Windows Update. Under Windows 10, the update can be blocked with the linked tool (see also How to block Windows 10 updates). Intel Bluetooth driver released via Windows Update (02/15/2017)? This entry was posted in Update, Windows and tagged Driver, Surface, Update, Windows. Bookmark the permalink. I got prompt to install this Important Update Microsoft – HIDClass – 5/14/2018 12:00:00 AM – 3.3.207.0, on my Window 7 Desktop Machine, I did install but after reboot, CPU fan was making loud noise, we checked CPU fan, it was clean and working but with loud noise. We did system restore and now Machine works fine. followed your suggestions to block this update.